Do you Camp or recreate on Public Lands in California? Do you know to be legal you must have a valid California Campfire Permit in your possession? Do you know where and how to get your Free "California Campfire Permit"? Watch a short video - take a quiz - get your online permit - save or print pdf or just bookmark the link on your mobile device to display when needed. Permits expire on December 31 of the year issued. Do not get caught with a campfire without your Campfire Permit! DON’T KNOW WHO YOUR STATE SENATOR IS? Enter your address, city and zip code. Click on “Locate.” Your Senator will appear to the right of the map along with their contact information. Mojave Trails National Monument - The Cady Mountains, The Marble Mountain Fossil Bed, Bristol Mountains, Piute Valley and Cadiz Valley, Ship Mountains, Little Piute Mountains, and Sacramento Mountains, Afton Canyon, Chuckwalla Spring, Hummingbird Spring, Barrel Spring, Fenner Spring, Cadiz Dunes, Amboy Crater, Pisgah Volcano lava flow are all inside the monument. 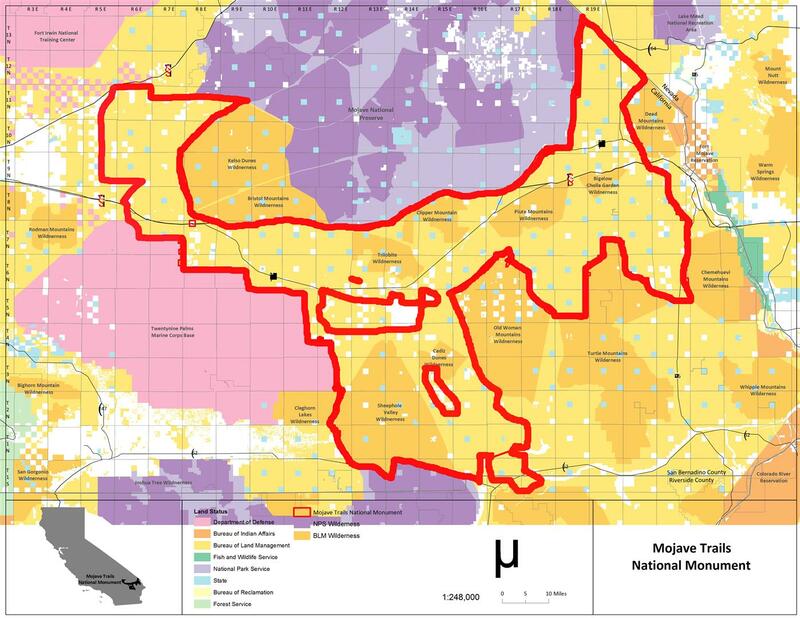 You have probably noticed that the Mojave Trails National Monument is deceiving in that the effective Monument boundary will cover an enormous amount of land, far more land than the proclamation. 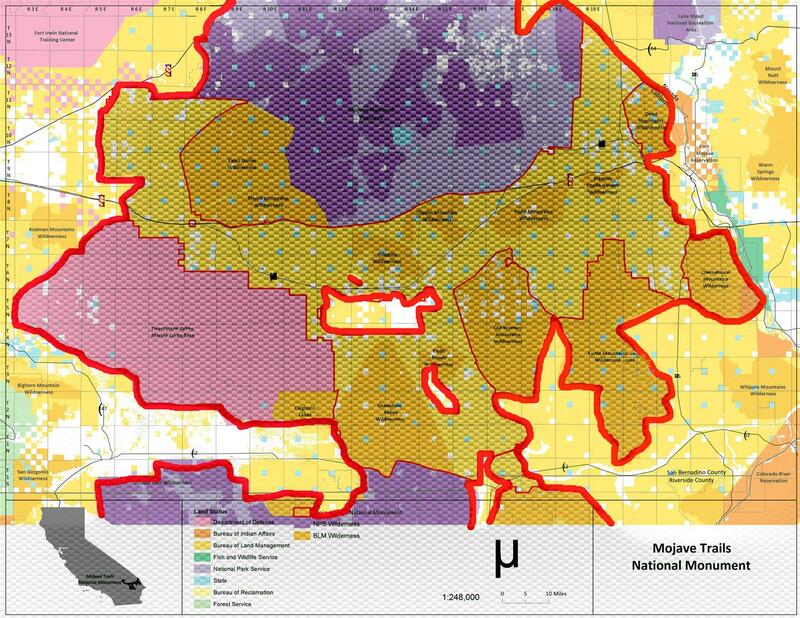 The Monument contains 6 no vehicular entry Wilderness Areas, but also connects to and effectively incorporates into it's boundary, another 8 no vehicular entry Wilderness Areas, 1 no entry Military Base, and the no collecting lands of the Mojave National Preserve and Joshua Tree National Park. Recreational Rockhounding is the collecting of reasonable amounts of nonrenewable resources such as rock and mineral specimens and materials, common invertebrate and common plant fossils, semiprecious gemstones and Petrified wood for noncommercial (Personal and Educational) purposes where permitted by law. Recreational Rockhounding is accomplished in a manner that prevents hazards to public health and safety, and minimizes and mitigates environmental damage. Support your right to collect Rock and Minerals in the Southern California Desert and the New National Monuments - Get Involved, be Pro-Active. It is the only way to save Rockhounding inside the Mojave Trails National Monument! It is up to you! Could Rockhound Firldtrips on Public Lands go the way of some OHV Events? Read More! BLM Issues Interim Final Supplementary Rules for Kanaka Valley (BLM News Release) The BLM's Mother Lode Field Office is requesting public comments on proposed new rules affecting 695 acres of public land known as Kanaka Valley in El Dorado County. http://ow.ly/DWnlN Speak now or forever hold your....... you know the rest! Download an image of the Desert Quartzite Solar Project proposed site in eastern Riverside County (BLM). The draft EIS/EIR and draft Land Use Plan Amendment, along with the agency preferred alternative for the Desert Quartzite Solar Project, can be viewed on the BLM ePlanning website at: https://goo.gl/GmkJk4. The publication of the draft Environmental Impact Statement in the Federal Register through the Environmental Protection Agency on Friday, Aug. 10 will signal the start of the 90-day public comment period, which will end on Nov. 8. In addition to the draft EIS, other documents made available for comment include the Environmental Impact Report and draft Land Use Plan Amendment. The Clock is Ticking, Rockhounds! H.R. 403: To establish the Clear Creek National Recreation Area in San Benito and Fresno Counties, California, to designate the Joaquin Rocks Wilderness in such counties, and for other purposes. Providence Mountains State Receration Area - Mitchell Caverns State Park. H.R. 376: To provide for conservation, enhanced recreation opportunities, and development of renewable energy in the California Desert Conservation Area, and for other purposes. Note: This bill will have an affect on Recreational Rockhounding in the Deserts of California. H.R. 255: To provide for an exchange of lands with San Bernardino County, California, to enhance management of lands within the San Bernardino National Forest, and for other purposes. Note: This bill may have an affect on Recreational Rockhounding in California. In California there is already an existing ban on Ivory import and sales, but that ban has an exemption for sale of Ivory that had been imported prior to January 1, 1977, which protected a significant portion of the Ivory owners in California at the time. Experts tell us that exemption covers millions of dollars of ivory objects in the state that don’t fall into the otherwise very narrow exemptions in the existing law. State Assembly Bill AB-96 Animal parts and products: importation or sale of ivory and rhinoceros horn. Release of wilderness study areas. “(a) Finding.—Congress finds that, for purposes of section 603 of the Federal Land Policy and Management Act of 1976 (43 U.S.C. 1782), any portion of a wilderness study area described in subsection (b) that is not designated as a wilderness area or wilderness addition by section 1301 or any other Act enacted before the date of enactment of this title has been adequately studied for wilderness. “(6) the Soda Mountains Wilderness Study Area. S. 32: California Desert Protection and Recreation Act of 2017 - A bill to provide for conservation, enhanced recreation opportunities, and development of renewable energy in the California Desert Conservation Area, and for other purposes. H.R. 381: To designate a mountain in the John Muir Wilderness of the Sierra National Forest as “Sky Point”. On the submission of an application by Imperial County, California, the Secretary of Transportation shall seek, in accordance with section 47125 of title 49, United States Code, and section 2641.1 of title 43, Code of Federal Regulations (or successor regulation), a conveyance from the Secretary of a parcel of Federal land administered by the Bureau of Land Management comprising approximately 3,500 acres adjacent to the Imperial County Holtville Airport (L04) for the purposes allowing the County to expand the airport. Frogs and Toads - DRA Page - What is at stake! Frogs and Toads - The California Off Road Vehicle Association (CORVA) filed commentary opposing the listing and habitat.. The Bureau of Land Management has scheduled an additional public meeting for public comment on the Soda Mountain Solar Project's draft environmental document. The meeting is scheduled for Saturday, Jan. 11, 2014, from 1 p.m. to 4 p.m. at the Travelodge Inn and Suites Yucca Valley Meeting Room, 54850 29 Palms Highway, Yucca Valley. HR6286 Clear Creek National Recreation Area and Conservation Act of 2012 --- This bill would close rockhounding areas under new wilderness, but leave off road access in place. Rockhounds should read the text of the bill and should contact their elected official to voice their opinion on this bill. Read the bill below on this page under Clear Creek Management Area. Read a letter to Congressman Doc Hastings through the hyperlink below. ISDRA RECREATION AREA MANAGEMENT PLAN "A Major Step in the Right Direction"
The Inyo National Forest is finalizing its environmental impact statement and forest plan. To celebrate our progress, and prepare you for when we release the final documents this fall, we’re offering you a preview of the Inyo’s updated plan direction for sustainable recreation and aquatic and riparian resources. This isn’t the only preview we have planned. In the coming weeks, you’ll see updated plan direction for wild and scenic rivers and species of conservation concern. All this information will be available on-line at: http://www.fs.usda.gov/goto/r5/FPRPreview. When you see the Inyo’s final forest plan later this year, you’ll notice we made a few changes based on many of the suggestions, ideas and comments you provided us. For instance, we refined our analysis particularly around recreation, wild and scenic rivers, recommended wilderness, aquatics, grazing and fire management. We improved the plan’s architecture to provide better organization and clarification based on your comments on the draft forest plan (published May 2016). Curious about the Sequoia and Sierra National Forests? We’re continuing to address public comments in a revised draft EIS for these two forests. We’ll share updates on that progress in the coming months as well. These previews offer a glimpse into plan development as it is happening. This process is information sharing; we are not receiving formal comments. The completed, final EIS and Inyo plan will be available for a 60-day objection period this fall. If you have questions feel free to contact Deb Schweizer, Public Affairs Officer, Inyo National Forest, at 760-873-2427. Get more Information at http://www.fs.usda.gov/goto/r5/FPRPreview. It is not to late to save Recreational Rockhounding in these National Forests, if we get involved, NOW! Do not wait, Get Involved! Unauthorized routes are scattered throughout the Cleveland National Forest. BUSTED! Los Padres National Forest ticketed 200 Santa Barbara families for parking by the side of the road to let their kids play in a rare snowfall. It seems that little adventure requires an "Adventure Pass." Read the story HERE. The strongly worded, 15-page decision says any member of the public who walks, hikes, rides a horse, picnics on the side of a road, camps at undeveloped sites, even parks in a national forest "without using facilities and services" is allowed to do so without being charged. Charging a fee, such as the Adventure Pass, even for someone who visits an area with amenities but doesn't use them, violates the FLREA [or, Federal Lands and Recreation Enhancement Act], according to the decision. Current Status on California Desert Protection Act of 2011 -- S 138 (Died in Committee) Look for bill to reappear in Harry Ried's new Omnibus Land Bill! Ref. : S21 - California Desert Protection Act of 1994 Summary - Where it all began!